Steven (Chicagoland, United States) on 20 March 2017 in Business & Industry and Portfolio. This is a roof-seat break carriage that is owned by Dr. and Mrs. Bill Chambers. The Chambers family history on Mackinac Island, Michigan reaches back to Bill’s great-grandfather arriving on the island from Ireland in 1830. Bill Chambers was the island Veterinarian for many years. He and Mrs. Chambers, along with other family members, have built and refurbished many carriages over the years. 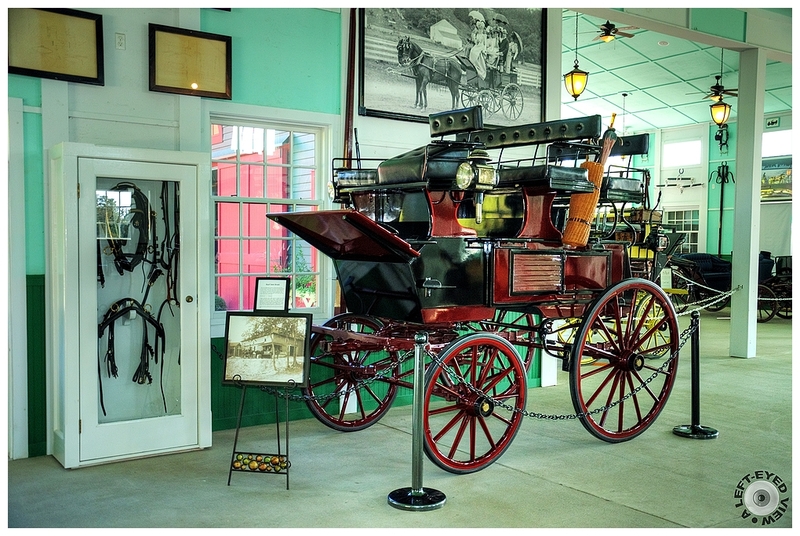 The large image on the wall behind the carriage dates back to the late 1800’s. The picture is of a family on a carriage ride in front of Fort Mackinac. Photo captured October 4, 2016. Ah, those were the days ! superbe mise en valeurs de ce carrosse Steven..
Great piece of history ! Really stunning carriages. The ride was certainly smooth. Maybe a little wobbly. This carriage is just gorgeous and elegant! I think that it would be fabulous to take a ride in one. I am glad that the have refurbished this one. It is spectacular! What a wonderful piece of history. In Portugal, we have a museum all of it dedicated to old carriage. One day you come to Portugal, do not forget to visit the museum. Nice old carriage. Well done. ha ha sembra una carrozza marziana!! !